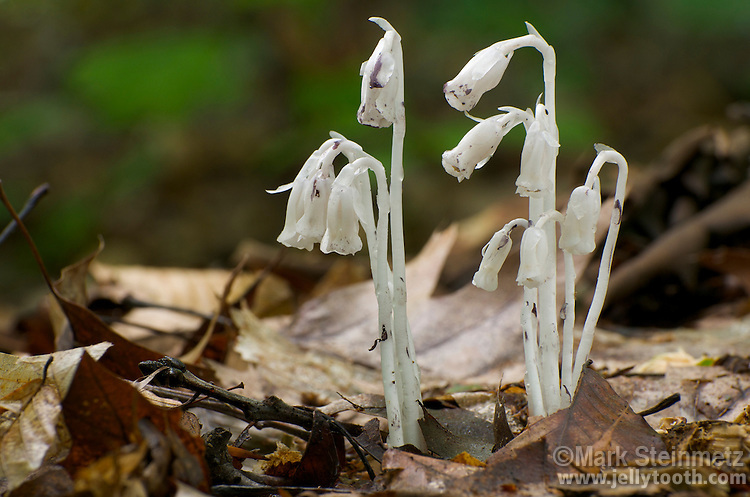 Indian Pipe (Monotropa uniflora) wildflower, also known as Ghost Flower and Corpse Plant. This heterotrophic plant lacks chlorophyll and is often mistaken for a mushroom. It obtains nutrients via root contact with mycorrhizal fungi, which in turn are obtaining sugars and other nutrients via a mutualisitc relationship through the roots of a nearby photosynthetic plant. In this way, technically Monotropa is parasite on the fungi, by "fooling" the fungus into thinking it's forming a mycorrhizal partner. Knox County, Ohio, USA.